Ah fall. The air gets cooler, the leaves give a final grand show of color before falling, and somehow before all that the cosmetic collections for the season begin to come out. Chanel presents Les Essentiels de Chanel for Fall/Winter 2012–a cool-toned collection to sweep you front the last gasps of summer into the first few snowflakes of winter. 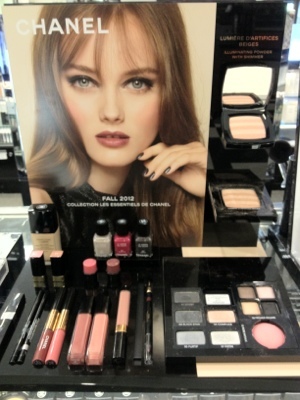 Fall 2012 from Chanel has arrived! One of the things I love about highlighters made by luxury brands is the ornate decoration stamped into the product. 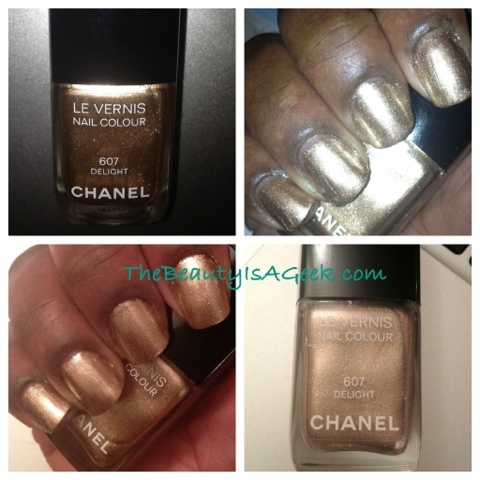 The highlighter offered by Chanel for Fall 2012 is no exception. Described as “two shades of beige, infused with fine golden sparkles to highlight and define a radiant complexion that looks natural in the sun or glowing in evening lighting” this highlighter is imprinted with pretty ‘sequin’ mini-circles and alternating stripes of beige and light peach. If you are darker than olive-tone I would highly suggest swatching this in person before making a buying decision. I did get to see this in person and while it did look pretty on my dark skin it didn’t make me want to buy it right then and there. Chanel Fall 2012 Display at Bloomingdales. Don’t know what was up with the missing peach eyeshadow. As a blush addict I love these for the buildability of color and the Rouge Joues Contraste blushes from Chanel are no exception. Going by the press photo the offering for Fall looks to be a bit fair for dark skintones (you can always use a highlighter underneath to negate this) but as Chanel promotes this as a shade complimentary to all skin tones, and after checking it out in person it’s mostly true. On my red skintone it seemed a bit chalky at first swatch but sheered out nice. Again, it didn’t scream ‘buy me’ like Malice did but it is a pretty universal pink. Definitely check this one out in person to swatch if you can. 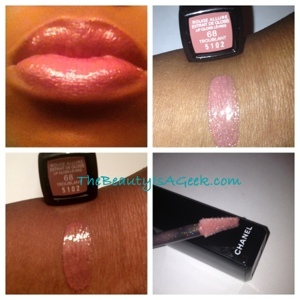 I’ve always admired how beautiful Chanel eye shadow quads are and this one is no exception. Seemingly wearable by all skintones, this quad is a mix of neutral tones of intense black (for smoke and lining), beige, tender pink and slightly scintillating taupe grey. You can definitely make a few gorgeous smokey eye looks with this palette. I have always found the quads to more of a value for your luxury beauty dollar than the singles, especially with the included mirror. There are five (5) eye shadow singles in the Fall 2012 collection. 1) Complice (natural soft peach) 2) Eclaire (sheer golden) 3) Furtif (pale romantic grey) 4) Infini (eye-opening silver) 5) Noir (intense, matte black). 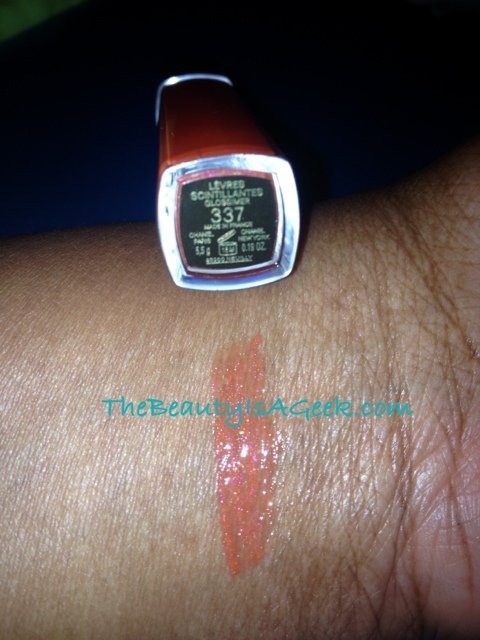 They look nice and are pigmented well but the only one that stood out to me when swatching in person was Furtif. Furtif is described as a pale romantic grey but there are some shimmers in it that I think would look amazing to enhance a black smokey romantic eye. Two color shades are offered. One called Silver Light (limited edition) and another called Noir Intense (rich, carbon black). 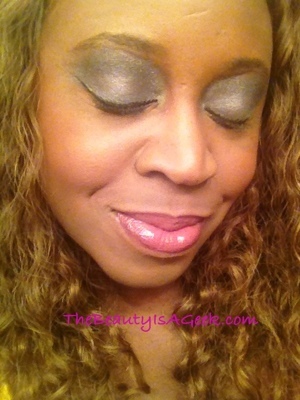 I am partial to the Silver Light for adding a pop of shimmer to the tearduct area and under the browbone and I think it would look amazing layered on top of Noir Intense. Silver Light is a limited-edition color while Noir Intense is permanent. The iconic Rouge Coco lipstick has several offerings for Fall/Winter 2012. Rouge Coco in Caractere is a brown with a dash of violet plum. Two Rouge Coco Shines in Chic (transparent beige with fine golden sparkles) and Parfait (tender pink with a touch of gold). Where Rouge Coco lipsticks are more opaque, Rouge Coco Shine lipsticks appear to give a hint of color on the lips that isn’t a gloss and isn’t quite a lipstick. Chanel’s lip pencils aren’t something I’ve tried before but the color description pulled me in as I’m such a sucker for plum lips in the fall. But when I saw this in person and it had a little brush attached at the end, I was sold! The pencil is soft, very pigmented and blends nicely with the attached slanted brush. This is a new offering from Chanel. 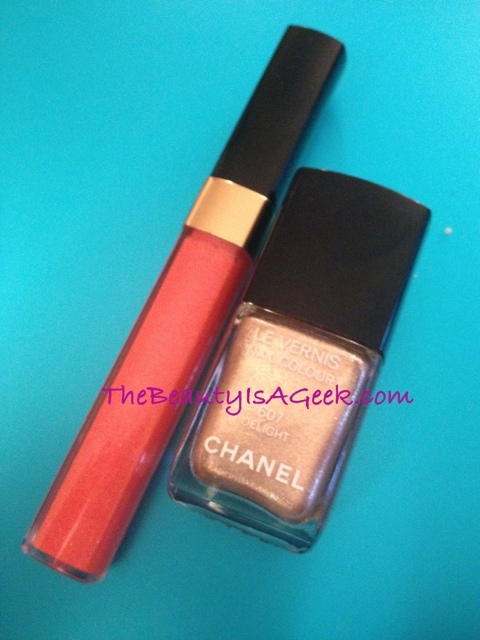 Chanel brings two limited edition colors of it’s Rouge Allure Extrait de Gloss or Fall 2012. Caprice, a delicate pink with a hint of grey and Troublant, a bold violet-plum brown. It is an understatement to say how much I love these. Intensely pigmented with enough shine to stand out but not so much your lips don’t look shellacked, these glosses are elegantly packed in a slim black packages with a doe foot applicator. I made it a point to pick up Troublant due to its unique coloring which I feel will look amazing with a sage green smokey eye. Caprice is a pretty pink but if you are dark skinned, be sure to layer and/or outline your lips with a light brown pencil before applying this color so it isn’t washed out by your skintone. Also offered is a Levres Scintillantes (AKA Glossimer) in Sweet Beige. This is described as a discrete beige with a hint of sparkle. Glossimers usually have less pigment than the Rouge Allure lipglosses and this one would be great for giving a slight color lift to the lips. 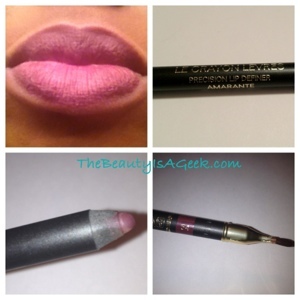 Definitely consider layering this over the new lip pencil Chanel is bringing out with this collection. Vertigo – an almost black lacquer that contains a heart of red pearly particles that reveal themselves according to the light. Frenzy looks to be the most dupeable of the three. 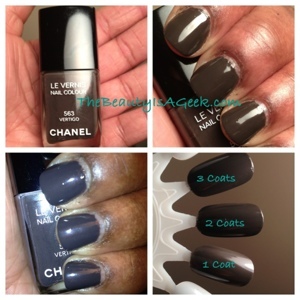 At first glance it appears to be very similiar to Rescue Beauty Lounge’s Jane and Essie’s Sand Tropez. Suspicious also looks dupeable as there are plenty of bright fuchsia polishes but it is still very alluring. Vertigo looks to be the star out of all three. The finish sounds quite different than what I’m used to seeing Chanel put out and it could wind up being this Fall’s ‘Peridot’ people were clamoring for. Chanel is the classic beauty line. Not very risky in terms of color but always on trend and always classy. Where the Summer 2012 line was very warm and not to my liking, the cool tones of Fall 2012 have me excited about several products. For sure I am picking up the lip pencil in Armante, lip gloss in Troublant. 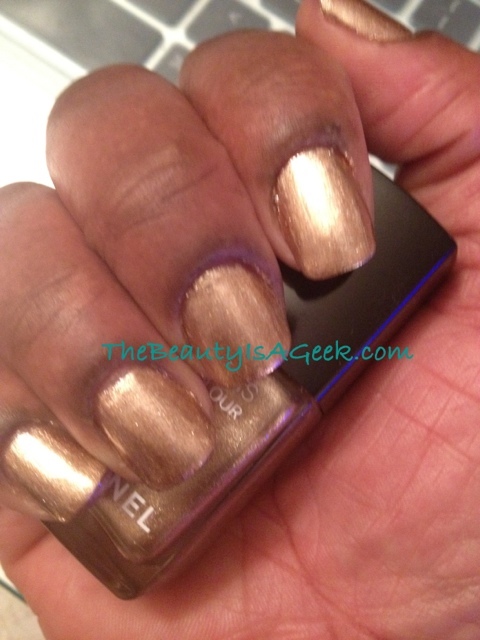 If there is room left in the beauty budget, Vertigo is definitely next on the list. Les Essentiels de Chanel was scheduled to be available at most upscale retailers begining in August of 2012 but I spotted it at Bloomingdales and online at Chanel.com, Nordstrom.com and NeimanMarcus.com. Of course always feel free to call your favorite Chanel counter to inquire if the collection is available for purchase. 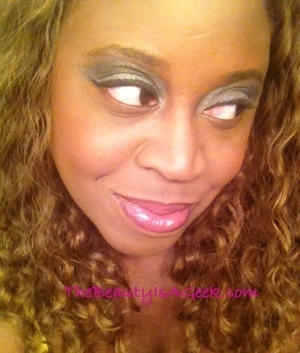 Love the lipgloss but the eye shadow…not so much. Goes on smooth but easily dupeable with MAC’s Silver Ring Veluxe Pearl eyeshadow or if you have it, Hocus Pocus from MAC’s Bloggers Obsessions collection. I know I said I wasn’t going to pick anything up from this collection but when I saw the pieces in person, I just had to have the lipgloss and nail polish. 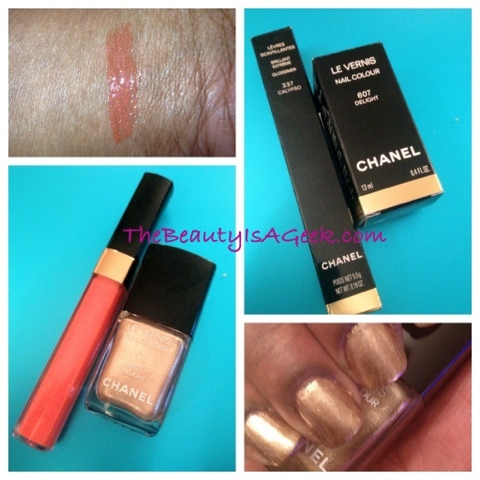 In general I’m not a big fan of Chanel’s glossimers because while it is big on shine, most of them are bland in color. 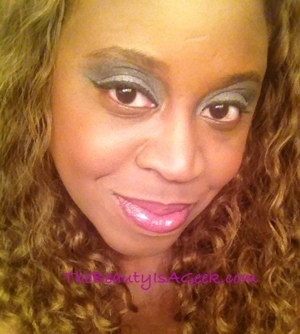 Calypso (and also Jalousie if you can find it) is VERY pigmented which make it a must-have for me. Caylpso is a tangerine orange with shimmer and will give your lips a nice tropical kiss of peachy orange with or without lipiner. It reminds me of SpaRitual’s Laughing In Pink. A beautiful warm beachy color that reminds me of the sun reflecting off of the hot sand on Miami Beach. Gorgeous next to tanned, deep and especially dark skintones. While it is paque in one coat, I can’t speak to the longevity of the wear until I’ve worn it for more than 1 day. The finish is slightly gritty but I like how it reminds me of beach sand. Retailing for $29.50 and $26 respectively, the Calypso Glossimer and the Les Vernis in Delight are limited edition products. The Chanel Summer 2012 collection is now available for purchase at Chanel.com. Not sure when it will hit regular stores but I’d suggest calling your favorite Chanel counter to find out the exact date. Chanel Summer 2012 collection now Available! UPDATE! This collection is NOW AVAILABLE on Chanel.com‘s website. Thanks to CafeMakeup.com, there are some preliminary images of Chanel’s Summer 2012 collection. Let’s take a look, shall we? I really can’t say I’m enthused about this collection. The colors skew too warm for me and the palette is rather bland. This is definitely a collection for those who aren’t big risk takers in the color department this Summer. What are your thoughts?